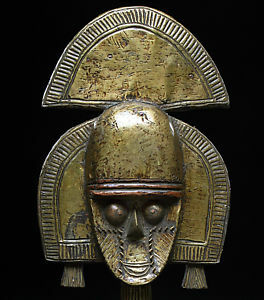 Types of Art: The arts of the Yoruba are as numerous as their deities, and many objects are placed on shrines to honor the gods and the ancestors. Beautiful sculpture abounds in wood and brass and the occasional terracotta. Varied masking traditions have resulted in a great diversity of mask forms. Additional important arts include pottery, weaving, beadworking and metalsmithing. Religion: The Yoruba claim that they have 401 deities; in truth, there are more than these. The complexity of their cosmology has led Western scholars to compare them to the Ancient Greeks and their impressive pantheon. Yoruba deities are known as orisha, and the high god is Olorun. No organized priesthoods or shrines exist in honor of Olorun, but his spirit is invoked to ask for blessings and to confer thanks. The Yoruba believe that when they die they enter the realm of the ancestors where they still have influence on earth. Annual homage is paid to the grave sites of ones' forbears, and lineage heads are responsible for honoring all deceased members of the lineage through a yearly sacrifice. Maskers (egungun) appear at funerals and are believed to embody the spirit of the deceased person. Other important orishas include Eshu, the trickster; Shango, the god of thunder; and Ogun, the god of iron and modern technology.